At launch there are nine versions on offer, based on two engines, two transmissions and five trim lines – badged ‘1’, ‘2’, ‘3’, ‘GT-Line’ and ‘GT-Line S’. ‘GT-Line’ and ‘GT-Line S’ bring an unprecedented level of sportiness to the Picanto range, with bespoke exterior and interior styling and exclusive trim features. Later this year the most powerful engine ever offered in a Picanto – a 99bhp 1.0-litre T-GDi turbocharged unit – will become available. The third-generation Picanto will be available only as a five-door car, since three-door models account for only 10 per cent of sales in the city-car sector – a share which is diminishing. In this corner of the market, size matters. Customer research shows that city-car buyers do not want big cars, so the all-new Picanto occupies exactly the same amount of road space as the previous model, with an overall length of 3,595mm and a width of 1,595mm. However, those figures do not reveal the ingenuity that has gone into the new car's packaging to improve passenger and luggage space. 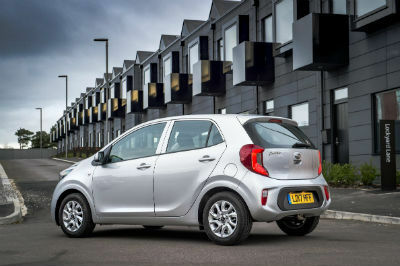 Advanced connectivity and driver assistance features are now available to keep occupants fully in touch with the outside world while minimising the risk of accidents, the car is based on an all-new platform featuring twice as much high-strength steel as the previous Picanto for strength and safety. Extensively modified versions of the 1.0-litre and 1.25-litre normally aspirated petrol engines from the previous Picanto reduce fuel consumption and emissions. The all-new Picanto is capable of up to 64.2mpg, with CO2 as low as 101g/km. Small cars do not have to be spartan. In fact, customers cite equipment levels among their chief considerations in deciding what to buy. The all-new Picanto will not disappoint. Even the entry-level grade ‘1’ model features electric front windows, remote locking with a folding key, tinted windows, a radio with AUX and USB ports, a tilt-adjustable steering column, automatic headlight control, Electronic Stability Control (ESC), Vehicle Stability Management (VSM), Hill-start Assist Control (HAC), 60:40 split folding rear seats and six airbags. From grade ‘2’, air conditioning, electric rear windows, electric heated door mirrors, Bluetooth with music streaming, a leather-trimmed steering wheel and gear-lever become standard. There is a four-speaker rather than a two-speaker audio system, body-coloured door handles and side mirror housings, high-gloss black centre fascia trim, a chromed grille surround and 14-inch alloy wheels in place of steel rims. Grade ‘3’ adds 15-inch alloy wheels, a supervision instrument cluster, Autonomous Emergency Braking, front foglights, electric folding mirrors with LED indicators, a floor-mounted sliding centre armrest, automatic air conditioning, cruise control with a speed limiter, a 7-inch 'floating' central display unit with satellite navigation and full connectivity, Bluetooth with voice recognition, DAB radio as part of a six-speaker audio system, a rear parking camera and sensors and chromed exterior door handles. Distinguishing features on the ‘GT-Line’ model are 16-inch alloy wheels, sports front and rear bumpers and side sills, a dual exhaust, black and red faux leather seats, a supervision instrument cluster, electric folding mirrors with LED indicators, satin chrome interior door handles, privacy glass on the rear windows and tailgate, bi-function projection headlamp units, LED daytime running lamps and rear lights, a chrome beltline strip and stainless steel pedals with non-slip rubber inserts. To this, ‘GT-Line S’ adds a wireless phone charger, an electric sunroof, heated front seats and steering wheel, a smart key and push-button engine start/stop, a 7-inch central display unit with satellite navigation and connected services, DAB radio, rear parking camera and sensors, a dual-height boot floor, luggage net and hooks and a driver's-side illuminated vanity mirror. The ‘GT-Line S’ and grade ‘3’ versions are distinguished by the 7-inch centre-mounted 'floating' touchscreen, giving access to the navigation, infotainment and connectivity systems, which include integration with Kia Connected Services powered by TomTom and Android Auto and Apple CarPlay via apps pre-loaded onto a smartphone. All models from grade ‘3’ have Autonomous Emergency Braking which can bring the car to a complete stop at certain speeds and to a partial stop at up to 107mph. This means that many accidents can be avoided, while the severity of others is considerably reduced. This feature is a £350 option on grades ‘1’ and ‘2’. Torque Vectoring, a first for Kia in the city-car class, is a further aid to handling stability. Using the anti-lock brake and stability control sensors, it detects when the car is drifting off its intended course in corners and gently brakes the inside rear wheel if the front of the car is running wide, or the outer rear wheel if the rear tyres are starting to slide outwards. It is standard on all models. While the all-new Picanto is no longer or wider than the previous model, it provides significantly more passenger and luggage space. It is 5mm taller at 1,485mm, and has a 15mm longer wheelbase – now 2,400mm. The front overhang is shorter to give the car a squatter, sportier stance, while the rear overhang is longer to enhance the profile and create more luggage space, which goes up from 200 litres to a class-best 255 litres. This increases to 1,010 litres with the rear seats folded. There is a lower waistline to make the cabin lighter and more airy, a slimmer dashboard to enhance space for the driver and front passenger, and lower seats placed further backwards in the cabin. There is more front head, leg and shoulder room than in the previous model, with largely unchanged space in the rear. 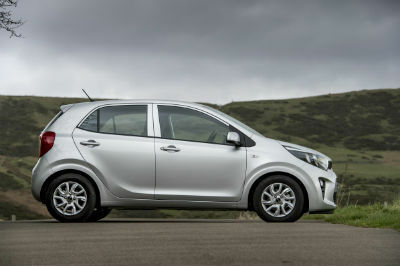 The changes in wheelbase and overhang dimensions have given the all-new Picanto a different character to its predecessor. Whereas the previous model was regarded by buyers as 'cute' and 'cheeky', the newcomer is sportier and more sophisticated. It has a more voluminous body which is simpler and more modern. The design was a joint effort by Kia's studios in Germany and at Namyang in South Korea. At the front there are wider grilles and air intakes flanked by multi-focus reflector or bi-function projection headlamp units, depending on model. The front foglamps, where fitted, are housed in separate side grilles or, on GT-Line and GT-Line S models, within the main lower grille. Air curtains in the side grilles channel air away from the wheel arches and wheels to reduce turbulence and improve aerodynamics while adding a more dynamic appearance. There is a bolder, more assertive bumper, which is echoed at the rear. The top of the windscreen is castellated, as on the Sportage. The black upper radiator grille with a silver paint or chrome surround is wider and slimmer than before, emphasising the Picanto's sportier appearance. At the sides, the waistline is lower and flatter, the window area has consequently been enlarged and the wheel arches are more emphatic. Wheels of between 14 and 16 inches in diameter fit snugly in their housings, there are body-colour or chromed door handles, black or chrome belt-line strips and black or body-coloured door mirrors, with integrated indicators on upper models. The wide rear roof pillar – a familiar Kia styling feature – is now more upright to accentuate the greater cabin space. At the rear, C-shaped rear light clusters are retained, but these are now larger and feature added detail. 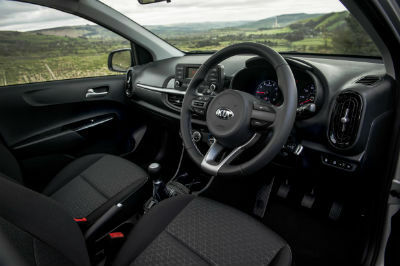 Inside, the all-new Picanto follows other recent Kias with a horizontally structured dashboard split into display and control areas, separated by a satin chrome trim strip which emphasises the cabin's width and the car's strong, stable stance. Vertical ventilation outlets at the outer edges of the dashboard act as bookends for the instruments and display areas. New materials and trim enhancements emphasise the significantly improved quality of the all-new Picanto. The seats are in smart black cloth, premium black cloth or black and red faux leather, depending on model; there are black, silver paint or satin chrome door handles; and leather trim adorns the steering wheel and gear-lever from grade ‘2’. The new range of paint choices has Blue Breeze as the standard colour with Clear White as a £250 option and Silver Frost, Titanium Silver, Midnight Black, Chilli Red and Pop Orange as the premium alternatives, all priced at £495. In line with the majority of city cars, the all-new Picanto is available only with petrol engines because diesel engines add to the purchase price while offering few advantages in overall running costs. The all-new Picanto's three powerful and refined engines will include – for the first time – a 99bhp three-cylinder 1.0-litre T-GDi unit, which becomes available later in the year. All three engines are from the Kappa family. The T-GDi unit is supported by a three-cylinder 66bhp 1.0-litre engine and a four-cylinder 83bhp 1.25. Both of these are multi-point injection (MPi) engines, now with reduced fuel consumption and emissions thanks to extensive re-engineering. The entry-level 1.0-litre engine, for example, is capable of 64.2mpg, with CO2 emissions of only 101g/km. Yet they provide lively performance for zipping around in urban traffic, with plenty in reserve for motorway driving. A five-speed manual gearbox is standard, but a four-speed automatic is optional with the 1.25 MPi engine. The third-generation Picanto is built on Kia's all-new and immensely strong H platform, which boosts both driving dynamics and safety. The amount of advanced high-strength steel in the body construction has doubled compared with the outgoing Picanto, from 22 per cent to 44 percent, making the all-new car's shell not only more robust but also 23 kilogrammes lighter. At the same time, the amount of structural adhesives bonding the body sections together has increased almost nine-fold, from 7.8 to 67 metres, to add further stiffness. 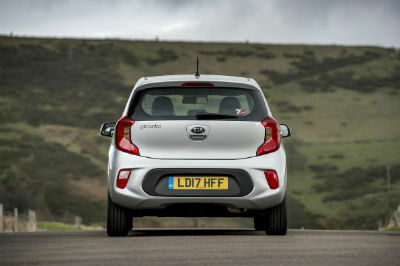 As a result, the all-new Picanto is 32 per cent better than its predecessor in torsional stiffness and 12 per cent better for tensile strength. A stiffer body benefits ride comfort and handling by allowing the suspension to do its work without having to compensate for flexing; helps to reduce noise, vibration and harshness; and provides a stronger, safer barrier in the event of impact. The all-new Picanto, like its predecessor, has MacPherson strut front suspension, but now features a U-shaped torsion beam at the rear and revised trailing arms for improved handling with reduced weight. Steering column-mounted Motor-Driven Power Steering (MDPS) with quickened responses reduces turning effort for parking and manoeuvring while providing a firm feel and good feedback at higher speeds. The ride and handling also benefit from measures to reduce cornering roll, while the longer wheelbase and shorter front overhang improve agility and shift the weight balance slightly rearwards. Re-packaging of the mechanical components lowers the centre of gravity, which further boosts responsiveness. Driver and passenger well-being has also been improved by measures to reduce noise, vibration and harshness. These include greater use of foam, insulation pads and body strips, plus new engine mounts and revised, quieter heating and ventilation units. Even the windscreen wipers have been placed lower to reduce wind noise. 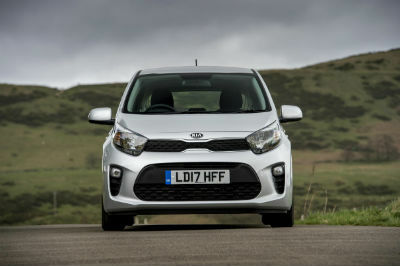 The Picanto competes in the A-segment, or city car, sector of the UK and European car markets, one step down in size from traditional superminis. It is a sector which is reducing with increasing customer demand for crossover-type models over conventional hatchbacks, yet it still represents huge business for Kia. 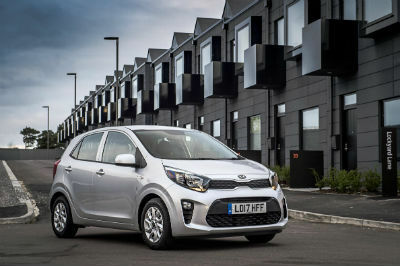 The segment accounts for more than one million sales a year in Western Europe, and the all-new Picanto is expected to take around 5.1 per cent of this, with sales of more than 60,000. In the UK, A-segment sales amount to around 130,000 a year and the Picanto has regularly been one of the top five best-selling models. The UK contributes almost a quarter of all-new Picanto sales in Europe. Around 60 per cent of buyers are women, and private buyers account for four out of every five customers. Price, exterior design, value for money and equipment – areas in which Kia has traditionally been strong – are the prime motivators among customers. Kia confidently expects the more stylish, more spacious, more sporty and more modern newcomer to increase its market share significantly in the next few years. In common with all Kias, the all-new Picanto comes with the best warranty in the business ­­– a seven-year/100,000-mile declaration of faith in the reliability and quality of the car, covering all labour and parts except those subject to normal wear and tear. The warranty is transferable if the car is sold before the time/mileage limit expires. The new Picanto is also available with Care 3 and Care 3 Plus servicing packages. These cover the cost of all routine servicing work for three or five years respectively and, like the warranty, can be passed on if the car is sold before they expire.